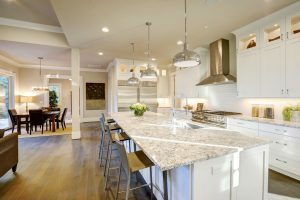 Countertop Color Selection - Columbia Builders, Inc. Choose the best countertop color to fit your kitchen’s design aesthetic with these tips! Kitchen selections are among the most important decisions you’ll make for your new custom home. It is often the area where homeowners give the most careful consideration to both function and style. Countertops play a major role in your kitchen’s overall appeal – whether you choose a monochromatic blended look or opt to bring your countertop to the forefront of your design. And, with so many ways to find inspiration online – bring us your ideas! Our Columbia Builders team will help you customize your new home’s kitchen to achieve the look you desire within your budget. Is your aesthetic more traditional or contemporary? The answer to this question will help you decide which white will work best. Whites have taken off in popularity, and they range from solid white to subtle patterns. With veining to simulate marble, and small flecking motifs which can soften the countertop and even coordinate with other colors in your kitchen, these choices compliment traditional or transitional décor and can be found in a wide variety of materials. If you want a truly contemporary or minimalist look, solid white counters are the choice for you – though your material selection will be limited to a manufactured product. Either way, whites lend a light, bright, clean look to your kitchen design. The most neutral choice in countertops lies in the middle, or medium, tones. Think soft grays and beiges with a distinct pattern. They are a universal choice for those who shy away from the cool and crisp look of white in favor of a softer hue that brings harmony to your kitchen’s design elements. Medium tones blend exceptionally well with painted cabinets including cream, gray, taupe and even colors such as pale blues and greens. If you desire contrast, such as dark cabinetry and white walls or tuxedo cabinetry, a medium counter will provide a sophisticated and coordinated look. Want a stand-out in your kitchen design? Dark counters will add visual interest and drama! Whether choosing a nearly black counter for a classic look with white cabinetry or selecting a dramatic natural granite with a lot of movement within the stone, this selection will be the statement piece in your kitchen. Dark or richly veined and contrasting stone will look best with either white, gray, taupe or espresso stained cabinetry, and often plays best against larger spaces. This entry was posted on Friday, August 3rd, 2018 at 10:01 am. Both comments and pings are currently closed.